Anyone who lives in Las Vegas has seen their fair share of palm trees. Trimming and caring for these is no easy task, as they pose unique challenges when compared to other kinds of trees. 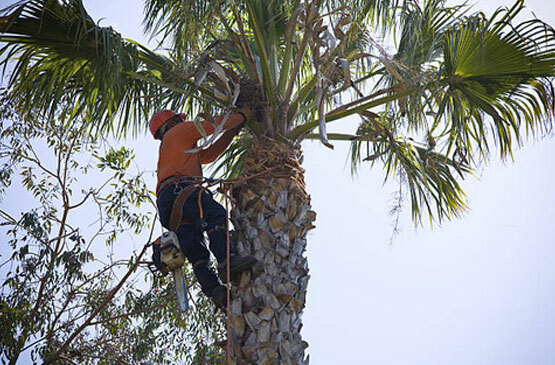 Nevada Tree Service offers high-quality palm tree service in Las Vegas, Henderson, and other nearby cities. Our experts know a great deal about these trees and how to work with them. We can trim down leaves as well as remove flowers and fruit stalks. Palm trees are unique, which means having a qualified service provider is important. Hiring unlicensed or uninsured workers can lead to subpar results and serious liability. No one wants the headache and costs associated with job done poorly, which is why our team has such a commitment to professionalism and excellence. We also offer thinning-based palm tree service in Henderson, Las Vegas, and the surrounding areas to make a tree more balanced and give it a neater appearance. If your tree has grown too big for you to safely trim it yourself, let us help you. Need palm tree service in Las Vegas, Henderson, or another nearby location? We offer affordable solutions with satisfaction guaranteed. Ask us about a free estimate – contact Nevada Tree Service online or call (702) 433-4700 today!